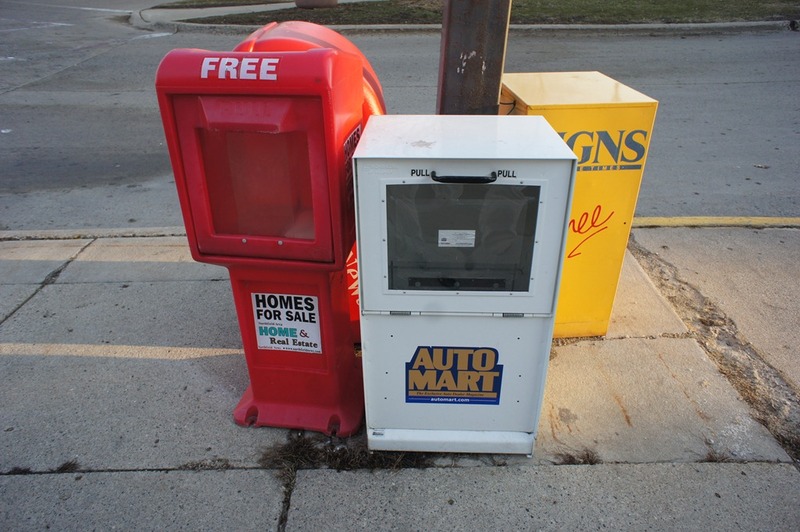 Last June, I whined about all the ugly recycling bins and newspaper vending racks downtown. There were plans to do something about it. Any chance that the City of Northfield Streets, Parks & Facilities Division, the Streetscape Task Force (website still out-of-date), the NDDC, Northfield in Bloom (website dead), 1st Ward Councilor Suzie Nakasian, and whoever else could get together and address this problem this year? WOW Griff, you and I must have some sort of ESP going on this morning. We had a Streetscape meeting this morning and we all stressed the need to get the newspaper corals, new recycling containers and dumpster corals done. I have been very upset with the pace the taskforce has been moving, but I was told at the next meeting we will have an action plan for the summer and when things will be getting done. When we get that, I can pass it along. Thanks, Hayes. Glad to know we’re in sync! Any chance you can apply pressure to whoever at City Hall to update the Task Force website so we citizens can know who’s actually on it now? My concern is that it being the middle of April, we will not see improvement until Memorial day, or after. These containers, in their current form, are nothing but large scale urban clutter. 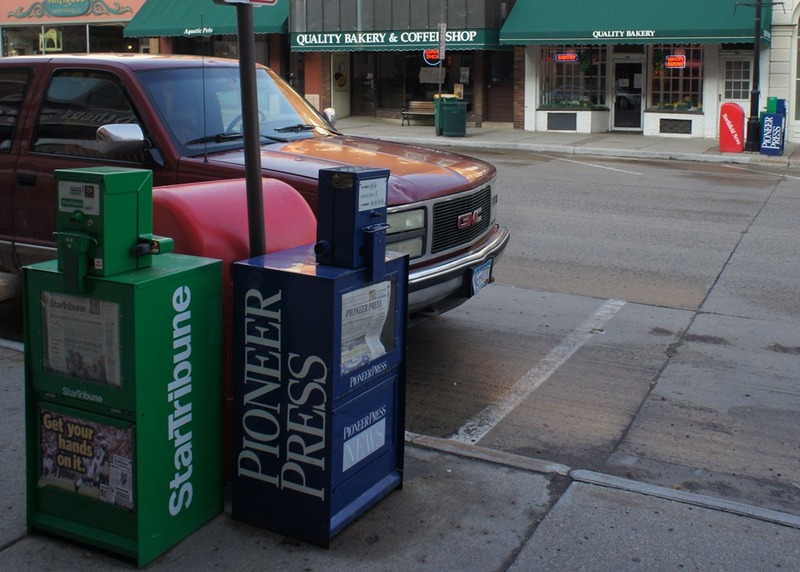 Is it REALLY necessary to have NINE Northfield News racks in a six square block area? In many communities, the newspapers are in an attractive, columnar stand (stacked 3 high) in the center of a block, with something attractive screening it. Perhaps one near the Archer House, one by GBBM, another outside Hogans / Hideaway, and another near the VFW? Do these companies pay a fee for a permit to place these in our downtown? Picture #2 is EXACTLY what I am talking about. Two complete sets of newspaper racks directly across the street from each other. Honestly, do we need both? … And, if you walk less than a half block around the corner of the Historical society, there is another set. Can’t you walk an additional 25 feet to get a paper? I’m glad you spotted that photo, John. I was amazed as well… right across the street. The next meeting is in May. Regarding the newspaper corals, Northfield will have to pass an ordinance limiting where they corals go. I know in some communities they do charge a fee, but Northfield will have to come up with an ordinancce. If you have some ideas, send them to Tim Madigan. A motion was made by C. Zweifel and seconded by C. Ganey to pass RESOLUTION 2011-007– INITIATING STREETSCAPE PROJECT PRIORITIES 2-11. All in favor. Motion carried. Included in Projects 2-11 are dollars for newspaper box corrals, among other things. Some of these projects will be completed in 2011, the rest of them in 2012. The Task Force is waiting for clarification from the City on the implementation sequence. Recycling bins have not be part of the Task Force discussions to this point, although it’s clear that they should be. My feeling is that I’d rather have ugly recycling bins, than no recycling bins. It’s a start and maybe a good motivator to move to something more pleasing and more permanent. 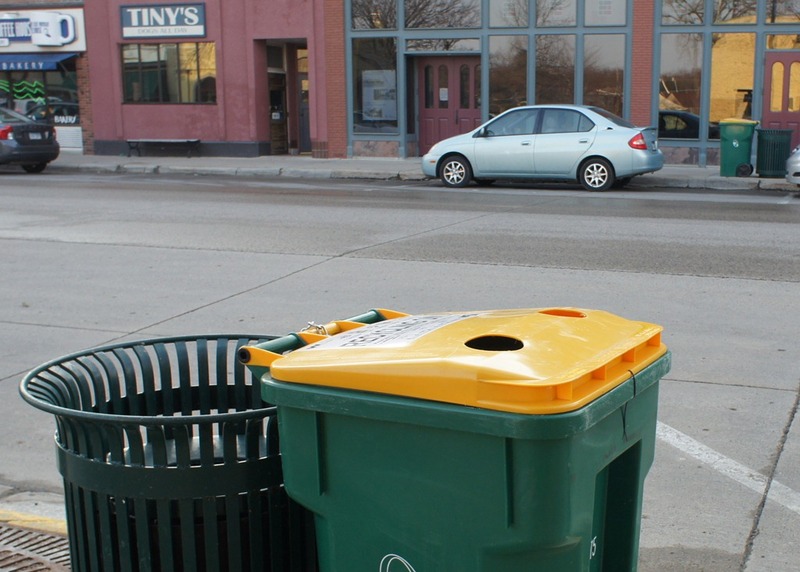 Street Supervisor TJ Heinricy has been working with Waste Management staff to develop a test-recycling program for the downtown area over the past several months. If the testing had already been occurring for several months in June of 2010 when Joel wrote that, surely there must be some results by now. As I said earlier, downtown recycling has not been discussed at any Streetscape Task Force meetings that I’ve attended. 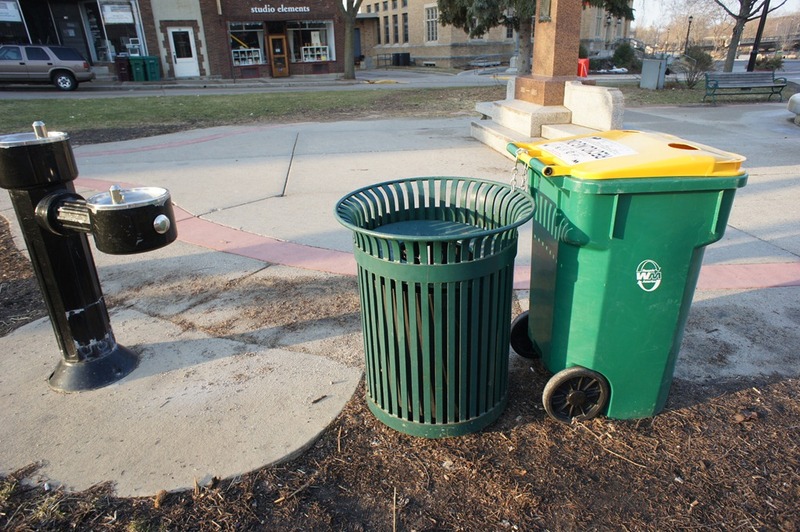 I believe this project is being conducted by the City’s Public Works Department and is in response to citizen concerns that there be recycling options in public areas of the city. TIF money is not being used for this project. Whether it will in the future is yet to be seen. I attended today’s Streetscape Task Force as a “substitute”…I guess you could say that I’m on the “B Team”. At any rate, Hayes wasn’t the only one concerned about the schedule. In Minnesota, construction season is a quickly opening and closing window. It seems that the priority is on the “big” projects like the Safety Center and Street Reconstruction, which probably makes sense to most people. On the other hand, some of the smaller projects can be implemented…literally…in an afternoon. Your Councilors are very interested in hearing your opinion on this subject. There are also probably a few of your fellow citizens who would appreciate your speaking to the Councilors about Newspaper Corrals, Recycling Containers, and…I can’t resist…Bike Racks. * Who is on the Streetscape Task Force? The website has not been updated in a long time. * Why is there no agenda or minutes published for the Task Force meetings? Gosh, this could be a long story. I’ve been thinking about writing a post on the recent history of the expenditures of TIF District #4 for some time, but I’ll just try to give you a quick answer to your specific question. The (Mayor’s) Streetscape Task Force was set up by former Mayor Lee Lansing. I believe it was, at least partially, in response to comments by the Chamber and NDDC on the decision of the former DIG (Downtown Improvement Group), which consisted of Keith Covey, Jim Pokorney, Dana Graham, and Susan Hoyt to spend hundreds of thousands of dollars on the paver projects. My understanding was that Lansing wanted to broaden public input into the decision-making process. Based on what I observed and heard, former City Administrator Joel Walinski was not a big fan of the Streetscape Task Force. He seemed to wish it would just go away and didn’t convene it for about 18 months. I know that NDDC board members Joe Grundhoefer and Keith Covey, supported by NHS E D Hayes Scriven, along with others, worked hard to get the group back together. When now-City Administrator Tim Madigan arrived in town, he reconvened the group. I’ve just attended a few meetings recently as a last-minute “sub”. It seems to me that the spiritual leadership for the group is provided by Bob Will. However, maybe it’s just that the rest of the group respects him for his long-time involvement with the HPC. Steve Edwins also seems to be a major contributor of energy and ideas; yesterday he gave an incredible presentation of photographs of the various entrances to Northfield. Finally, Dan Bergeson seems to gotten “stuck” with the job of being the group’s spokesperson to the City Council. Again, I’m only speaking from attending three of their meetings over the past six months, but they seem to work pretty consistently off a document that was, I assume, produced by City Staff, and presented to the City Council. It’s titled “Recommended Project Priorities” and I’m certain that it is available on-line in one of the City Council packets. As we’ve heard through various media coverage, the group’s top priority, “Parking Improvements”, raised questions for the Council. As I heard at a Task Force meeting, the Council also wanted to see some projects at the gateways to the community and perhaps a project visually connecting our two existing commercial districts. At Administrator Madigan’s recommendation, and I was present for this meeting, the Task Force decided to urge the Council to move ahead on the so-called “consensus projects” (the ones that the Council supported), conduct more research and analysis of the proposed “parking improvements”, and explore possible “gateway projects”. Mr. Edwins’ photographs of entrances to the town seemed to be a critical and valuable first step for this last category of projects. Newspaper corrals and dumpster enclosures, along with benches and bike racks, are part of the “consensus projects”. My sense of the discussion from yesterday’s meeting is that analysis of and recommendations on the recycling containers will be included as part of the planning work anticipated in 2011. You might check my sense of the status of these projects with Bob Will. However, not only does he not have a blog and not Tweet, he doesn’t even do e-mail. So I guess you’re going to have to do it the old fashioned way and talk to him. I think you summed it up pretty good. Thanks for that summary, Ross. Very helpful. Anyone know if Northfield has an ordinance now that controls the newspaper vending racks? I couldn’t find anything in the municipal code. There is not one. They city will have to draft one and go through the public process to get one in place. So we will probably not have the vending racks until after the summer. They may not be pretty but they at least encourage recycling. I for one am glad they are there. I don’t think these things are ugly. This desire to have everything so smooth and pretty and controlled and contained and suited to just certain tastes — sounds a little scary to me. I tend to ficus on harm. Who’s harmed by having newspaper racks – gasp! – right across the street from one another? As for newspaper racks, what if they were all pink? Or covered with graffiti? Or if we had twice as many? Three times? At what point would you want to intervene, even though no harm was being done? I meant “focus,” Ficus is some sort of ground cover isn’t it? Thanks, John! Perhaps my misspelling ‘focus’ as ‘ficus’ was not so far off. If ficus is a fig tree, the corrals that others have spoken of could be called a fig leaf to hide the offensive newspaper boxes. Stop lights and utility poles and fire hydrants are ugly (or anyway not usually regarded as beautiful) but they serve a purpose. Perhaps someone should sponsor a contest — have artists propose alternative designs or decorations for these newspaper vending boxes. Don’t hide them, celebrate them! Utility, beauty, and whimsy all in one! George, I’m glad to hear about the YES! students’ involvement in this. Be sure to show them the photos of/links to the innovative recycling bins in my June blog post. Could money raised by the youth groups doing the cardboard recycling be put towards this? Could the student YES! group start discussions with the Streetscape Task Force? The TF has money for this. Anyone know if Waste Management will contribute money towards this? Have they done so in other communities? From 1997-2009 I was responsible for anywhere between 1-50 newspaper racks, found them to be unsightly, downright ugly and a massive irritant to the residents as well as business owners. The companies that I contracted with were USAToday, Pioneer Press, Northfield News, Faribault Daily News; the only area paper I didn’t do single copy for was the Mpls Star Tribune. The newspaper industry has two sides-home delivery and single copy sales; online numbers would be a available now, but were not significant in 2006, when I left the corporate side of the industry. My tenure at the Northfield News was from 1998-2001 and I diligently tried to get the corporate management to replace, refurbish or cut down on the number of racks in town. What I was up against though, is that the more locations you have product, the more chances to sell, and management wouldn’t consider reducing the number of racks, no matter how low sales were. The public outcry wasn’t enough to make them move nor the business owners who complained either. The other side of the equation is that the carriers who deliver the product to the machine, make more profit per paper than the same paper sold in a store, or in the downtown case, Tiny’s, when Tim had the business open. While at the NNews, I strongly favored reducing the number of machines, but when I was the carrier for the single copy Pioneer Press contract, I wouldn’t move one out…there were four of them on Division from 2006-2009, just because of missing the possible sale. Single copy sales are almost always an impulse buy..if you want a cheaper paper, you get home delivery. Both the corporate and carrier attitude make for the long delay in getting any results for change. One of the contributors on this thread made a comment about the exact same machines on both sides of the street, right across from each other. Why? Because people don’t walk across the street..it is the laziest thing, but that is why you have the duplication. What else factors into the situation is that the the ABC (Audit Bureau Circulation) numbers are a combination of home delivery, single copy sales, online page views ; these numbers are highly valued as advertisers trust them when the ad rep comes knocking and says that “such an such a number of subscribers read the paper”. So again, taking out a rack, lessens the chance of a sale, which affects the internal numbers that validate advertising rates. I would love to see a “corral” or some type of built frame around the racks with a combination product that can handle the newspapers and the other types of free advertising that also get put out in racks. It could be made to look attractive with a type of treated wood and sensibly designed. You have to be able to access the coin easily, that function can be both from the top head being lifted, and some times the front of the machine. Some good planning around what is available from top industry suppliers could make this a nice looking area for the sale of the papers. It would also help with the vandalism that is an ongoing issue. Replacing the front window glass or plastic is simple, digging machines out of ditches, rivers, and what not gets tiresome, not to mention they are bulky and difficult to handle. I think customers could be trained to go the corral, initially there would be a dip in sales, but I bet the numbers would rebound. In the winter, snowshoveling around the racks is difficult and ice gets built up, as most carriers are out delivering before the business district get the sidewalks cleared. I personally like to see a earthy brown or black rack. 5 years ago I set the black rack at Perkins for USAToday. It was a shiny, glossy, metal that looked fantastic against the wooden siding and floors walking to the front door. Tonight I stopped to look at it, and now it is not so nice.The paint is peeling, rust is showing up, no rack card to dress up the bottom half of the machine. The cost to replace, carrier negligence, business owner not complaining, are the reasons unkept up machines are left on the street. I applaud your effort for trying to improve this situation. I can supply industry contacts if you want further information. Janalee, thanks much for this thoughtful and detailed comment. I think the Streetscape Task Force needs to invite you to their next meeting where you can be a highly compensated consultant on the issue! Janalee — your comment “It could be made to look attractive with a type of treated wood and sensibly designed” is going in the same direction the Transition-YES youth are planning. We hadn’t considered corralling the newspapers at this time — getting an OK to move forward with acceptable recycling containers and then building them might be all they could do! 1. Who is currently on the Streetscape Task Force? The list of members on the website has not been updated in a long time. 2. Why is there no agenda or minutes published for the Task Force meetings? I am sorry I have not answered your questions. I have been a little busy doing my job that I get paid to do. 1. Current Members that attend meetings: Hayes Scriven, Steve Edwins, Dan Bergeson, Joe Grundhoefer, Bob Will, and Ross shows up sometimes. I am not sure why no one else comes to the meetings. It has been very frustrating. 2. We do not get meeting agendas until a few days before and they are usually just an email from Tim. We do not have an official meeting note taker. I have always found this odd. I always take notes and keep them for my own personal tracking. When the group reformed we were keeping it some what informal and we rotated the note taker. Those were then sent back out to the entire group after the meeting. However, since the group has gotten much smaller we have not had an official note taker. Hope this answers your questions….now it is time for me to go back into history were I feel much more comfortable! Hayes — so what I take from this is that I should probably contact Tim to attempt to get a spot on the next or following agenda for any discussion of recycling containers, and then see if the time of your meetings would work for the high school students to attend. Correct? Yes George, please contact Tim. I think you idea is great. These are the kind of partnerships we are looking for. Streetscape Task Force: City Engineer Katy Gehler, on behalf of the TF, asked the council to authorize development of a request for proposal for a consultant to work with them to develop enhancements to Division Street, Bridge Square and gateways into Northfield, to be completed by the end of 2011. There is $38,000 budgeted in the Master Development Fund for this. Implementation will need to be complete by the end of 2013 when the Fund is terminated. Steve Edwins, a TF member, noted that there are ties with the work of the Roundtable. Because some felt there wasn’t sufficient specificity about the anticipated enhancements, the council requested an opportunity to see the RFP before approving it.